A rice transplanter is a specialized transplanter fitted to transplant rice seedlings onto paddy field. Mainly two types of rice transplanter i.e., riding type and walking type. Riding type is power driven and can usually transplant six lines in one pass. On the other hand, walking type is manually driven and can usually transplant four lines in one pass. But both of them little cost so many of them transplant by manually. If we rice transplanter manually, it takes lot of time to plant large plants. So we use mechanical transplanting machine. Mechanical transplanting of rice is the process of transplanting young rice seedlings, which have been grown in a mat nursery, using a self-propelled rice transplanter. The proposed model consists of circular wheel, lever which is linked with the planting link. By using kinematics, Kinematics is the branch of classical mechanics which describes the motion of points (alternatively “particles”), bodies (objects), and systems of bodies without consideration of the masses of those objects nor the forces that may have caused the motion. Kinematics as a field of study is often referred to as the “geometry of motion” and as such may be seen as a branch of mathematics. It is continuously drawn the rice plants into the field. It works on the basics of movements produced by manually pulling. When we manually pulling the machine it automatically rotates the wheel and correspondingly it touches the lever kinematic linked to planter stick. It continuously plants until we stop our pulling. It contains the rice which carries the plants. • First loading of seedlings. • Manually drive to machine in planter side. • Drive to the surface contact disc. 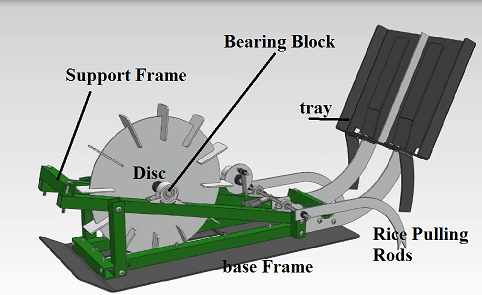 • That is disc connecting on another rotating disc by using chain drive. • We have to using crank mechanism. • That is mechanism drive to up and down motion on two lever. • Finally, that is lever planter seedlings in ground.